No tantrums here, just some good ol’ music. 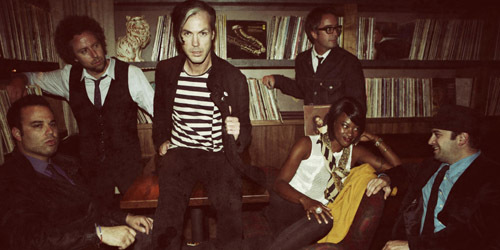 Hailing from Los Angeles, soulful sextet Fitz & The Tantrums has been around for nearly five years now, but are still gaining new fans on a regular basis. From their humble beginnings playing small clubs in California to a big fall tour this year around the nation with the electro-pop duo Capital Cities, the group is making their mark on popular music with an authentic old school vibe that has shone through all aspects of the band, from their material to their look. Their biggest hit to date on my chart, “MoneyGrabber”, spent a week at the top back in 2011, a song I initially didn’t like but slowly grew into over time. That was from their first LP, 2010’s Pickin’ Up The Pieces. However, with a new album making waves on the Billboard 200 and a few songs over the radio, the five men and one woman that comprise the band are more popular than ever, having played around with their sound a bit on their most recent collection to skew in a new wave direction. However, it also remains true to their R&B roots. Playing a short set on the fourth floor at Club Maxine’s in downtown Worcester, the band was split in half as what seems to be case with most of their radio gigs, with lead vocalist (and new father!) Michael Fitzpatrick, tambourine and vocalist Noelle Scaggs and bassist Joseph Karnes at the exclusive event with a trio of songs from their latest studio album, More Than Just A Dream, available on Elektra/Atlantic Records. With a retro-themed room at the venue and a retro-sounding band to boot, you couldn’t have asked for a better fit. Of course, the band took some pictures beforehand with several fans and were courteous about it before taking to the floor and getting down to business after a nice introduction. First off was “The Walker”, which was recently announced as the second Alternative and AAA single from the record. It’s also received a few television placements in the last few weeks. Built around some steady whistling, the more bare arrangement still gave off as much as fun as the studio cut, with Fitzpatrick taking on a different melody. I was obviously jealous that I can’t whistle. “Walker” isn’t the only current release that’s trying to bring back that trend on the Alternative survey, but in my opinion, it’s the strongest of the bunch. (Feel free to disagree.) Next up was “Fools Gold”, another great track from the effort and very much a contender for a single down the line. I almost didn’t recognize as a stripped down piece, but it was by far the best performance of the three, with Fitzpatrick sounding more energetic vocally and Karnes plugging away at his guitar. “Gold” was followed by a steady stream of questions from both audience members and on-air personalities – a bevy of musical influences (answers included hip-hop, soul, even a little Nirvana and Rush for Scaggs), playing with musical legend Daryl Hall on the web series Live At Daryl’s House (Fitzpatrick noted that Hall’s mother told him that he sounded like Hall, to which he responded, “Can I get a witness?”) and all the talk shows they’ve been on lately (Conan, The Ellen DeGeneres Show, etc.) Finally, they dug into “Out Of My League”, the song that recently became their first #1 song on the Alternative chart and biggest over all single of their career. We got some clapping involved, a little musical direction by Scaggs leading the crowd and the people were enjoying themselves. “League” spent five weeks at #2 on my chart back in April and May, so I’ve obviously been enjoying the song for some time, and they made sure to bring the flavor even in an acoustic setting. I’m sure it would rock more if I ever saw the full six-piece band live on stage. The band and their label rep were in a rush to drive down to Providence for a gig after the end of this, so I wasn’t able to chat with the act or get any sort of photograph with them, but that sort of thing happens sometimes. I’m still content that I managed to see them if only for a short bit. Their smooth jams are going to continue on for a long while to come. Let’s just hope they get the same kind of embrace come the next era, especially if it’s in the same league as their latest.